Want a quick and effective way to lose weight? All you’ll need to do is to get up 8 minutes earlier every morning, do these simple moves, and lose an average of 2lbs per week, with the right meal plan in place. 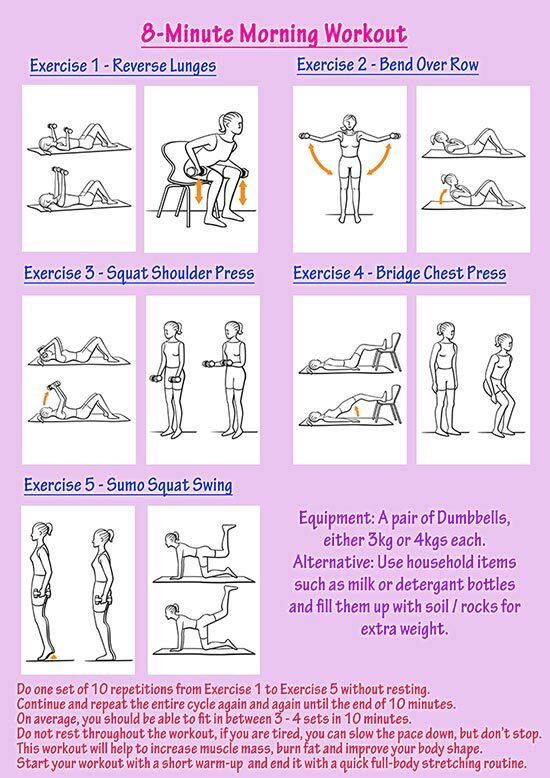 Workout Sequence: 2 exercises a day – exercise A & B. Complete a total of 4 cycles. Repetitions: Complete 12 repetitions from exercise A and immediately another 12 repetitions from exercise B, back to back without resting. Important Tip: If you find yourself able to do more than 12reps, you will need to increase the weight, if you are not able to do 12 reps, then decrease the weight. This 8 Minutes Morning Workout is SOLELY for weight loss and does not help to promote fitness gain especially in terms of cardio. I would encourage you to do your regular cardio + strength workout at least 3 times weekly, together with this. You can also combine this workout together with my other total body workout videos to gain the maximum benefits.